In what some critics describe as a long overdue effort, the Museum of Modern Art in New York is this month publishing "Modern Women: Women Artists at The Museum of Modern Art." The 500-page book, in the works for more than four years, is the centerpiece of a larger initiative to shine a light on women artists. From last December through summer, 2011, MoMA's curatorial departments are mounting 15 large and small exhibitions that highlight and temporarily increase the presence of works by women in the museum. "It is our ambition that this unprecedented, institution-wide effort will ultimately influence the narratives of modernism the museum represents by arguing for a more complex understanding of the art of our time," wrote Glenn Lowry, MoMA's director, in the book's Foreword. MoMA also held an international symposium on women on May 21. "My initial reaction is that this is good, this is exciting, and it has got potential," said Nancy G. Heller, author of "Women Artists: An Illustrated History," whose fourth edition was published in 2004. "But if it's true, as the book's description says, that this is 'the first effort by a major North American museum to examine its collection by highlighting the production of modern and contemporary artists,' then it's really shocking." MoMA has no precise numbers for women artists in its collection. But the ratio of male to female artists is approximately 4.5 to 1, excluding works by institutions (e.g., design companies and collaborative groups), "secondary artists" (like printers); "teams" such as Bernd and Hilla Becher; and the film collection. Art critic Jerry Saltz, who has frequently railed against the dearth of women at MoMA, favors the current effort even though it smacks of ghettoization. "I don't believe in hanging work in museums according to gender. But MoMA has been so frustratingly remiss in this area that for now I am in favor of anything that MoMA can do to get more work by women artists on view," he says. "If this means removing every Picasso and Matisse and Brancusi and Mondrian for nine months, do it." Whether more happens at MoMA after 2011 is anyone's guess. "Is it a structural change?" asks Heller. "It doesn't seem to be, but we'll see." The book, edited by Cornelia Butler, chief curator of drawings, with Alexandra Schwartz, a curatorial assistant, will remain, of course. 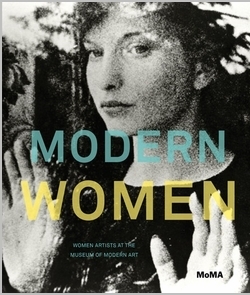 It is divided into three eras – "Early Modernism," which highlights eight women; "Mid-Century," which dwells on 12 women; and "Contemporary," which dissects 11 women. "We moved away from the canonical artists and a coffee-table book approach," Butler says. Such artists as Ana Mendieta, Sybil Andrews and Janet Cardiff, therefore, will be discussed in-depth alongside Louise Bourgeois, Adrian Piper and Bridget Riley. Butler says the volume, which includes both long and short scholarly essays based on new research, covers "many more" than that in less depth. The book does not always view women artists through a feminist prism. "It depends on the view of the individual writers," Butler explained. "If there is that reading of the work, we encouraged the authors to acknowledge it – but we didn't ask them to dwell on it." A look at the book's Table of Contents raises another matter: Nearly all of the authors are women, and that pattern is repeated at the museum, where all but one of the exhibits were organized by female curators. "We pushed hard to have men in the book," Butler says, "but I guess looking at women artists at MoMA and redressing history is just more of interest to women curators." Butler said she doesn't know if her efforts will lift any women artists in particular. Rather, she offered, "whenever MoMA pays attention to an artist it does have the effect of elevating them." With that caveat, she cites Atsuko Tanaka, Consuelo Kanaga and Dirt Palace as examples of some of the "surprises" in the book. Heller welcomes MoMA's steps in this direction for another reason, as an example: "There are plenty of other large museums in this country that have similar problems," she says.